Well, we have had a right to do down on the farm this week. Wendy has picked up quite a nasty repetitive strain injury. Unfortunately, I think it’s going to take some time to really heal properly too. What has she done? Oh, well it seems that she likes to give everyone nice big ‘doorstep’ sandwiches in the teashop and on one particular day last week she had a run of customers all wanting sandwiches. This meant she was cutting dozens of slices of bread all day and in fact it has been much the same story for the last three weeks. On the positive side though, the wrist will get better and the customers love the sarnies. Since moving out here, we have been blessed with much. One of my favourite things, sad as it may seem, is a tan, well a ‘Farmer’s Tan’ to be exact. Being a ‘Ginge’ has always meant that I had to daub gallons of sunblock on and steer clear of the sun, but dodging the sun isn’t all that practical these days. I do continue to put suncream on, as I should, but I now get tanned and am much less of the pasty little redhead that I have been for many years, which for me is a real bonus. This week has been a special week as Phyllis came out of hiding. In fact, what was really exciting was she wasn’t on her own either, as when she appeared she brought her two young ‘uns with her, Phoenix and Phillipa, and how cute are they. Phineas, their father, is still absent without leave, but I’m sure he’ll surface again soon. Oh, by the way, they are our resident pheasant family, if you hadn’t guessed. It’s that time of year again. The time of year that we need to start thinking ahead towards decisions that we need to make over the coming months and some of them are more pressing than others. For instance, when do I send some of my Highlands off to visit the bull? And who shall I send? What tup shall we bring in to visit our ewes in November? When shall I take our next pigs off for slaughter? When’s the best time to get ‘Miguel’ the llama castrated? Do we bring in a billy goat for ‘Stacy’ to have another kid? Peter rabbit and his friends excelled themselves this week. For some time now, in the vegetable patch it has been happily growing away, almost untouched by the little pests, but when you think that things are going well, that’s so often the time when they sneak in the back door and catch you off guard. One of the target areas in the vegetable patch previously has always been the carrots, as you would expect, and as a result we have secured the area with good netting. We dug the netting well into the ground and made it high enough, so that even if they thought about coming over the top, they couldn’t. Well, this week we were watering the veggies, as we do each morning when we noticed that there had appeared overnight a rather large hole in the middle of the carrot patch. 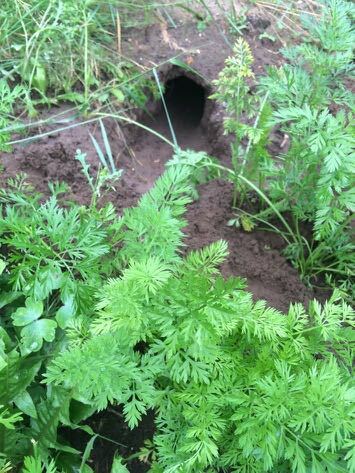 There were no signs on the outside at all, no muddy footprints, no holes in the netting, no step ladders aiding their entry into this prime carrot patch. They are far too smart for their own good and they had somehow conspired to dig a very effective tunnel from well outside the veggie patch which surfaced right in the middle of the carrots. I think it’s time for plan B.